Digital Subscriptions > Learn Hot English > Sample issue Learn Hot English > WHAT DO YOU LIKE OR DISLIKE ABOUT GOING TO THE HAIRDRESSER’S? WHAT DO YOU LIKE OR DISLIKE ABOUT GOING TO THE HAIRDRESSER’S? Before listening, make a list of the things you like or dislike about going to the hairdresser’s. Then, listen once. Did they mention anything that you thought of? 1. ...the hairdresser’s near his house? 2. ...paying more at the hairdresser’s? 3. ...the extras you get at the hairdresser’s? 4. ...the reason why he has long hair? Welcome to this sample issue of Learn Hot English magazine! Download it for FREE and see what a great product Learn Hot English is for learning English. Read the articles, listen to the audio files, and learn 300 new words and expressions! You’ll hear lots of different English accents too! Learn Hot English will really improve your English. Try it out for FREE! 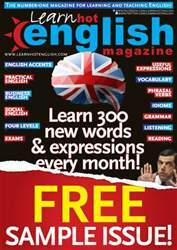 LEARN 300 NEW WORDS AND EXPRESSIONS WITH EVERY ISSUE OF LEARN HOT ENGLISH MAGAZINE! WHAT’S YOUR FAVOURITE MAIN DISH? Diana the film the British hate! The truth behind the magic!